In small sauce pan, combine 1/2 of the undrained raspberries and cornstarch; cook and stir until thickened and clear. Chill thoroughly. 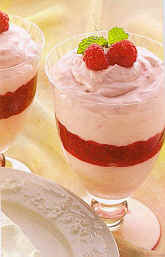 In blender, combine remaining drained raspberries, sweetened condensed milk, lemon juice; blend until smooth. Place in large bowl; stir in food coloring if desired. Fold in whipped cream. Spoon half the mouse mixture into dessert dishes; top with equal portions of raspberry sauce then remaining mousse mixture. Chill thoroughly. Garnish as desired. Refrigerate leftovers.